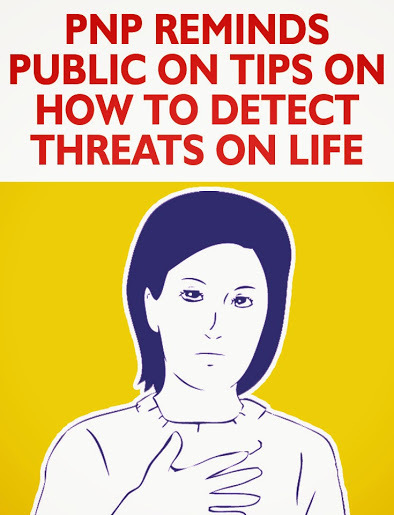 The PNP has released the Threat Detection and Threat Assessment Tips as part of its effort to prepare and equip the public with necessary information in times of life-threatening situations. In your daily routine, make an assessment if the person, the subject of your inquiry, is capable in terms of resources and manpower of inflicting harm to a person. Write down details of any suspicious actions of person or persons you have observed or noticed. Notes help us remember what had transpired in our observation. Refer to your employer or a security officer your suspicions or observations on a person who is likely conducting surveillance on you or your officemate. If you have been critical and have exposed significant or sensitive issues against a prominent person, monitor and get information, if possible, on the reaction of said person. Consider also your personal dealings as a possible cause for someone to plan to harm you or your family. Advise your family and the neighborhood to inform you of any person asking any details about you including your present disposition. Ask them to write down details of the suspected surveillance. Educate your family, employees and household personnel on security awareness. Do not trust your memory. Write down immediately your observations specifically on the 5Ws and 1 H (Who, What, When, Where, Why and How). Do not play the role of a secret agent or a detective. If you see someone stalking you, look at him in the eyes within a reasonable distance to let him know that you saw him and you will remember him the next time you meet. Write down details. Do not accost or confront the individual conducting surveillance on you. He might already be the assassin and that would only give him the opportunity to do his trade. Do not take any threat for granted as it may cost you your life including the lives of your family. Do not try to handle any threat situation by yourself. Always consult or refer to your employees, security officer and eventually, the police authorities. The above tips should be taken into consideration by all people specifically those whose profession or natures of job have made them a natural target of harm, Sindac said. They include journalists specifically hard-hitting ones, law enforcers, appointed and elected government officials, judges, lawyers, businessmen and even Church officials. This entry was posted in Advocacy, government, Law and Law-Related Issues, Safety tips and tagged family safety, personal safety, tips to protect lives, tips to protect yourself on June 25, 2014 by Yami.